This week we hear from European-based Aussie pro cyclist Amanda Spratt, who hails from my home state of NSW. Amanda, or Spratty as I believe she’s known, has had a solid start to 2017 with a few great results. She was the overall winner of the Women’s Tour Down Under series and second in the Australian National Road Race, a title which she won in 2012 and 2016. 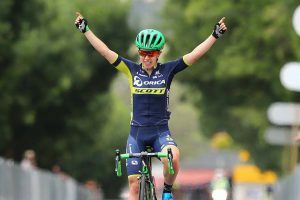 Q: You started this year well with a win in the Women’s Tour Down Under series on home soil, how has the year continued for you? My first goal for 2017 was to have a really strong Australia Summer which I think I accomplished quite well. It was a really great start for our whole team, and winning the TDU was definitely a personal highlight for me. It’s not often that I am the GC rider in a tour, so I definitely walked away from that race with a new found appreciation for being in that position. January was such a big month of racing for me so I took February as an opportunity to settle back in Europe and then head to Mallorca for a big training block before the next races started. I surprised myself with my form in the first races at Het Nieuwsblad and Strade Bianche with 6thand 8th, but it just goes to show how the legs can respond to a happy and hard training block beforehand. We have just finished the classics campaign, and I am proud of our whole Orica-Scott team – riders and staff. We really stepped up a level this year and were contesting all the finals. Gracie’s 2nd place in Flanders was definitely a highlight as well as Annemiek finishing Liege with the lead in the World Tour classification. Q: What are your goals for 2017? After Liege I had a one week break to recover and reset both physically and mentally. Now I am ready for the next big goals. For the next period, all of my training and racing is focused towards preparing as best as I can for the Giro. As a team we have some exciting goals, and we are really targeting the overall title this year. It’s the first time we have gone there with this ambition so it’s a goal that is really exciting for everyone. After the Giro, I will be looking towards the WWT races in August – Sweden and Plouay in particular and then hopefully build on that heading into the World Championships. The more I hear about the course in Bergen, Norway for the World Championships the more excited I am, so I am definitely aiming to be in top shape there. Q: You’ve been riding since you were 12 years old, how did you get into cycling? When did you realise you could have a professional career as a cyclist? I’ve actually been racing since I was 9 years old- I started out with BMX racing which I did for 5 years before moving across to the road and track. My Dad and Grandfather both used to race so cycling is definitely in the family and it is because of them that my brother Nick and I started with it. In my early years I never had a training program. Dad just guided my riding and I went out riding with him and my brother on the weekends. The road rides were still pretty hard though as we are all pretty competitive so we often spent a 30kms ride attacking each other on the hills around the Blue Mountains. Nick and I would also have tactical meetings on the road to discuss our options so I like to think that’s where my tactical knowledge began. I had my first training program and coach Michel Vermande when I was 16 years old and it was probably from this point that I realised this is something I really could imagine myself doing for a long time. After my junior career I was offered a full AIS scholarship right away, which took me to Europe in my first year out of juniors. It definitely wasn’t love at first sight as it was a very challenging transition into the senior ranks, but I’ve always been up for a challenge and every day I’m still working and pushing to become a better cyclist. Q: Do you enjoy being in an Australian team, where you compete alongside plenty of compatriots? I have been part of Orica-Scott since it first started in 2012. It’s special to be a part of an Australian professional team, and I think we become more like family throughout a season. This helps build trust amongst team mates and staff and I think it helps to gel everyone better as a team. Of course we are not all Australians, so it’s also special (and sometimes quite amusing) to teach some Aussie slang ;). Q: Where are you based when you’re in Europe? The base in Europe is in Gavirate, Italy where the Australian Institute of Sport have the European Training Centre. It has definitely become a second home for so many Australians from a range of different sports. I think when you are so far away from home for such a large part of the year it’s important to be able to feel comfortable wherever you are living. The facilities there are world class, and most of the Orica-Scott staff are based in the area as well. I also spend some time in Switzerland training there. The training in Switzerland has better variety than in Italy but the coffee is definitely better in Italy – always a critical factor in any cyclist’s life ;). Q: I believe you’re currently studying, what is the course? Is it hard to balance a pro cycling career and study? I’ve been trying to balance my pro cycling career and study since I left school. Initially I graduated with a University Certificate in Business and now I am working towards my Bachelor of Communications (Public Relations). If all goes to plan I should be finished the degree by the end of the year. It definitely feels like it has taken a lifetime to complete, but we are very lucky as elite athletes that so many universities are now providing assistance where needed through the elite athlete friendly program. It’s been hard to balance at times, but I still think it’s important to having something else for the mind to focus on, and a completely different outlet from the day to day training and racing mode, otherwise it is too easy to be 100% consumed by cycling. Q: What can we all do together to encourage more women to cycle at all levels of the sport and recreational pursuit? I think it can be daunting at times for a beginner because it often seems like such a male-dominated sport. This shouldn’t be the focus, I think it should be more about joining a community and meeting up with other riders and enjoying being out there. I see more women’s specific cycling clinics happening or evenings where the focus is on women’s cycling and I think these kind of events are important in encouraging and inspiring more women to get out on the bike. I also think joining a club can be beneficial as it gives you the opportunity to meet other riders in the area where you live. I always love heading down to my club in Penrith when I am there over summer. My favourite ride when I am home is also the Saturday bunch ride with a group of cyclists – male and female – from where I live around the Blue Mountains. It’s a great group, the atmosphere is friendly and relaxed and there is always that element of enjoyment which is the most important part of it all. Did you enjoy hearing from Aussie pro cyclist Amanda Spratt? Who else would you like to hear from? Include your suggestions in comments or via the Women Who Cycle Facebook page.